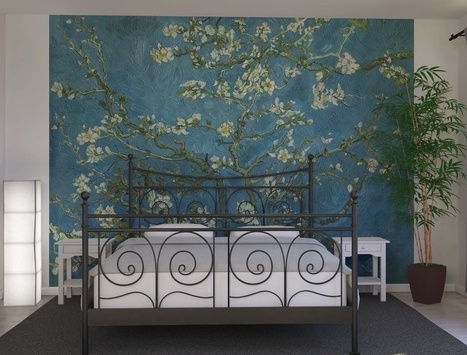 Recently, I installed this Van Gogh Almond Blossom painting as a wall mural in a master bedroom in an Alexandria townhouse. The result was amazing. My client ordered it from Sweden. It was custom printed and sized for the wall. And it was very affordable. This is another accent wall option for you. 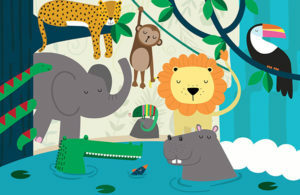 One piece of advice when ordering a wall mural like this … don’t opt for a mirror image. Everything gets flipped and it will not look like what you saw on the manufacturer’s web site. If you do want a mirror image, because of where you want to install the mural, i.e., around lightening fixtures or furniture placement, be sure to carefully measure. You can also call me and I can help you engineer this. I’ve been hanging murals and wallpaper for years and I can’t tell you how impressed this new printing technology is. It’s like being able to hire any of the world’s greatest artists to paint a masterpiece in your home. The quality is really tremendous. 1. Ceilings have a decorative function; they literally can raise the roof. Decorated ceilings can lift a room’s perceived height. 2. Like a carpet, a decorated ceiling can pull together all decorative elements (furniture, painting, window treatments, etc.). 3. It can be a high impact-low cost strategy to decorate a room. To wallpaper a ceiling you use less than one-third of the wallpaper needed to cover the walls. Mixing and matching striped wallpaper for borders is a way to define various fields of color within the room without the cost of decorative paint. 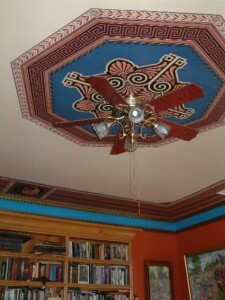 Above is a Victorian wallpapered ceiling. Take a decorating tip from the Victorians and raise the ceilings in your home.